Inmates from La Joya and Nueva Joya prisons constructed 250 confessionals used in the Sacrament of Reconciliation at World Youth Day in Panama, 2019. 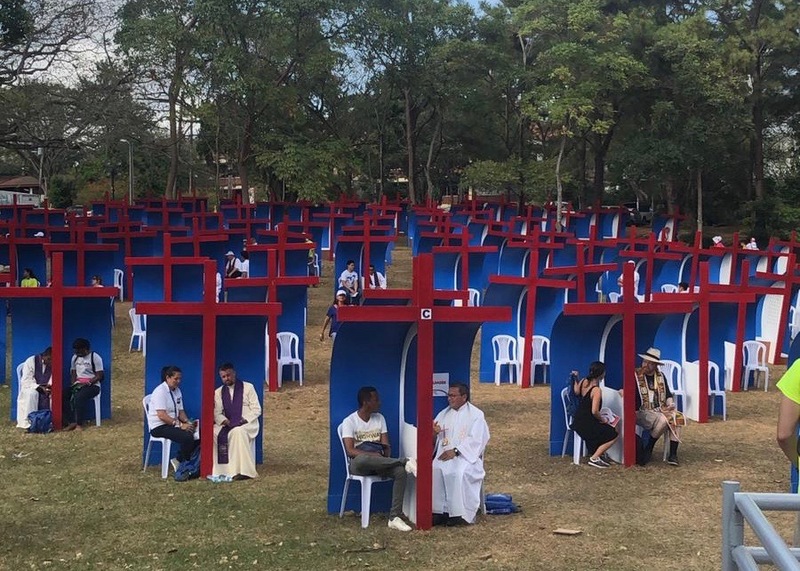 The confessionals were installed in Omar Recreation Park in Panama City. This is called “Forgiveness Park” during the youth event. 35 inmates are worked from 8:00 a.m. to 4:00 p.m. daily, sanding, painting, and assembling the crosses and wooden confessionals. Lilibeth Bennet was the interior designer who created different two models for the confessionals, inspired by the WYD logo and using the same colors. “Even though we won't be able to be there (at World Youth Day) we still feel that we're doing something important, and I thank God for the opportunity he has given us as prisoners to contribute to a mission as important as World Youth Day,” explained Luis Dominguez, who is in charge of painting and supervising the sanding of the confessionals. "Confession is an act of honesty and courage – an act of entrusting ourselves, beyond sin, to the mercy of a loving and forgiving God."